Le Danh Cuong is pictured feeding birds in this photo. 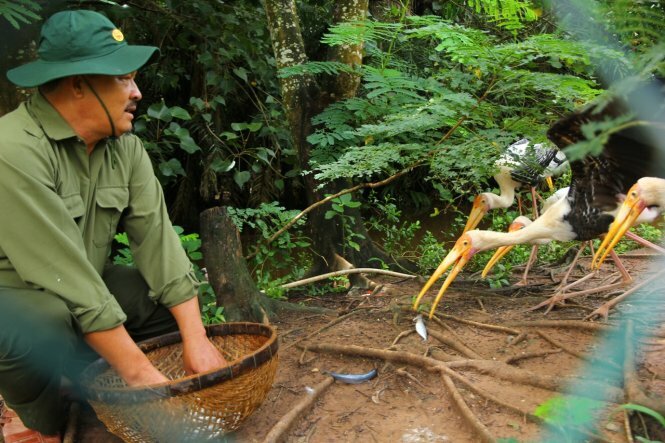 A sturdy man in the Mekong Delta province of Bac Lieu is called the trainer of wild birds though he is not an expert and has never gone through any training course. He is Le Danh Cuong, also known informally as Hai Cuong, 56, who has been hired to attract wild birds nesting in many resorts and bird sanctuaries in the region. Cuong said that he had not had any special love for birds until 1982, when he was demobilized from the army and began learning to farm, keep crocodiles, raise snakes, and breed monkeys and birds. He confessed that he has no specific secret to lure wild birds, except for spending time observing the habitat and habit of each species and creating suitable environments for them to stay and nest at night. With his skills and experience, Cuong has created and preserved a series of privately-owned bird sanctuaries in the Mekong Delta. Locals said the aficionado loves wild birds and sees them as his family. Miraculously, the feathered animals trust the man, who merely loved martial arts in his young age. In the middle of this month, Hai Cuong returned to work for the resort Vinh Sang in Long Ho District of Vinh Long Province in the Mekong Delta. At the resort, he was asked to train a herd of pigeons that follow brides and bridegrooms in their wedding parties for bridal photography. Vinh Sang is a favorite place for local couples to throw their wedding parties. Six years ago, he was hired to lure wild birds to stay and nest in the 1,000 square meter garden of the Vinh Sang resort and did it successfully. Birds at Vinh Sang are all used to the presence of big crowds during receptions. “Once the master takes action, it would be strange if birds don’t come,” Ut said. He agrees to work with most garden owners who love birds. He often makes some rafts to row in big ponds and grows different kinds of plants and ornamental trees to create natural habitats for birds. It normally takes three years to turn a deserted garden into a place where birds sing songs during daytime, Cuong said. Luring the first wild birds is always the most difficult task. Sometimes, he has to buy birds to keep in cages for a time and feed them routinely. Before releasing them back to the nature, he cuts the feathers on one wing to bar the birds from flying far away. Most of the birds return at the exact time for meals, as they were trained before. The very first birds act as a bridge to get others following them to a certain garden, Cuong explained. It is always advised to maintain a natural environment for wild birds. Food for them must be natural, too. He failed many times during the initial period when trying to feed wild birds frozen fish. Later, Cuong created small and shallow ponds to release live fish in for wild birds to prey on. Many resorts and bird sanctuaries in the Mekong Delta provinces of Tra Vinh, Hau Giang, Vinh Long, Bac Lieu, and Ca Mau have acknowledged his contribution to lure wild birds.